Median household income continued to grow for the fourth straight year, increasing to $53,006 and exceeding Pre-Recessionary levels (see Figure 1). This income growth was not universally enjoyed by all households, however. Trends show notable racial and ethnic disparities. 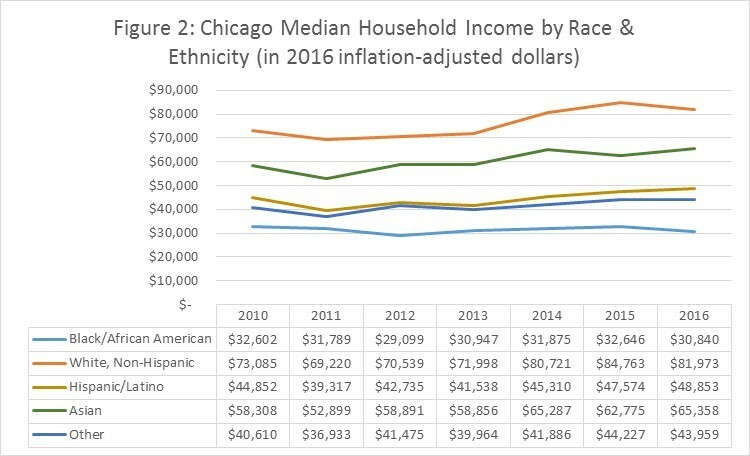 Median household income for white, non-Hispanic/Latino-headed households and for Asian-headed households grew 12 percent from 2010 to 2016, reaching $81,973 and $65,358, respectively. Figures for Hispanic/Latino-headed households increased 9 percent from 2010 to 2016, to $48,853. Median household income for black/African American-headed households lagged behind other racial groups, declining during this period to $30,840 (see Figure 2). 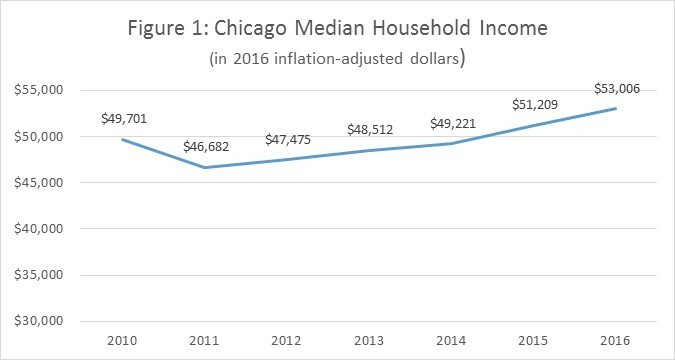 It’s difficult to discern the degree to which these changes in income were driven by migration of households in or out of Chicago during this period or by changes in the earned incomes of incumbent households already residing in Chicago. Signs indicate that some of the dip in income among black households was fueled by net out-migration of middle-income families. After dropping to a low of 42.9 percent in 2013, homeownership rates have remained fairly consistent through 2016 (see Figure 3). 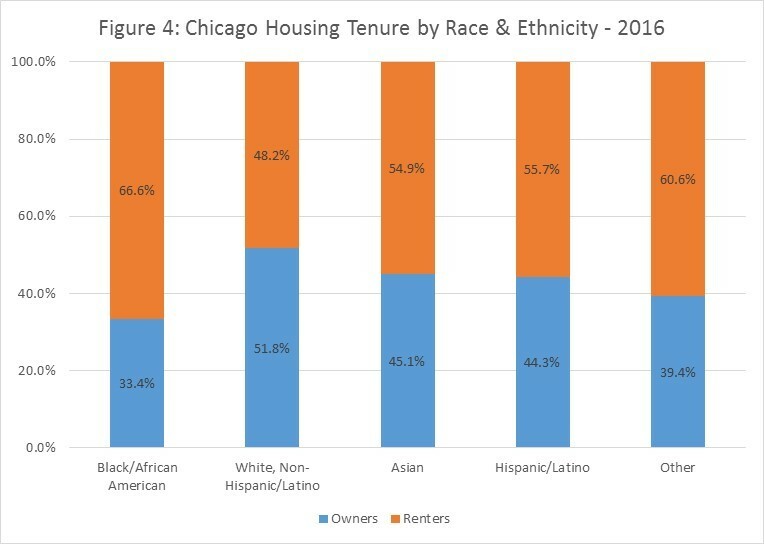 Patterns of racial disparities in homeownership have also remained consistent. Rates of homeownership among black households continued to lag those of their counterparts, sitting at 33.4 percent in 2016. Rates among non-Hispanic/Latino white households remained above the city average at 51.8 percent (see Figure 4). 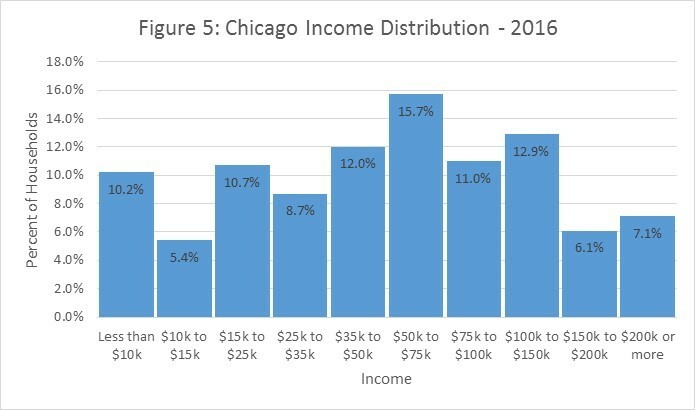 2016 ACS figures show 10 percent of Chicago households earn less than $10,000 annually, and 26 percent earn less than $25,000 (see Figure 5). 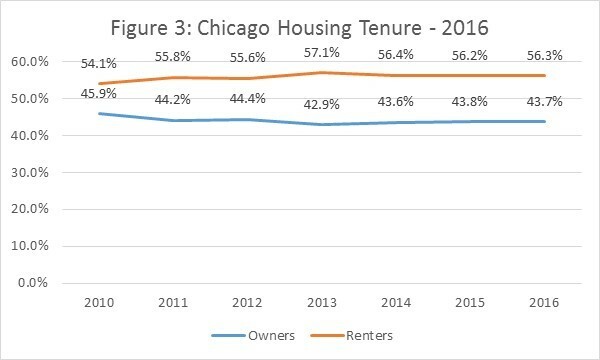 19.1 percent of Chicago households were below the federal poverty level, which is down slightly from 2015’s figure of 22.0 percent. 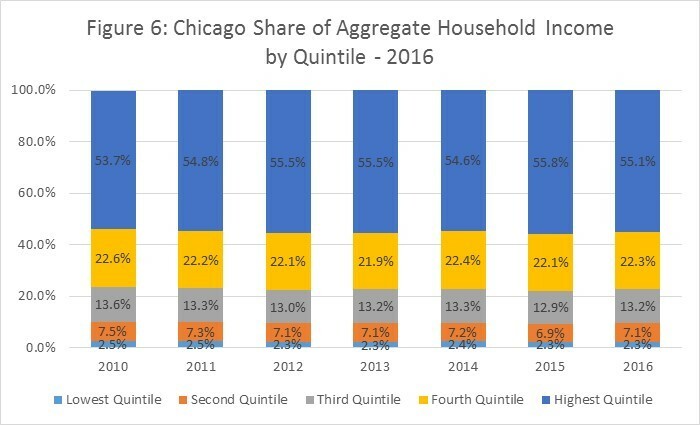 In 2016, the wealthiest 20 percent of households in Chicago accounted for 55.1 percent of all income, while the poorest 20 percent of households accounted for only 2.3 percent of income. Wealth concentration for the wealthiest quintile of households grew slightly since 2010, peaking in 2015 at 55.8 percent of all income, but dipping in 2016 (see Figure 6). 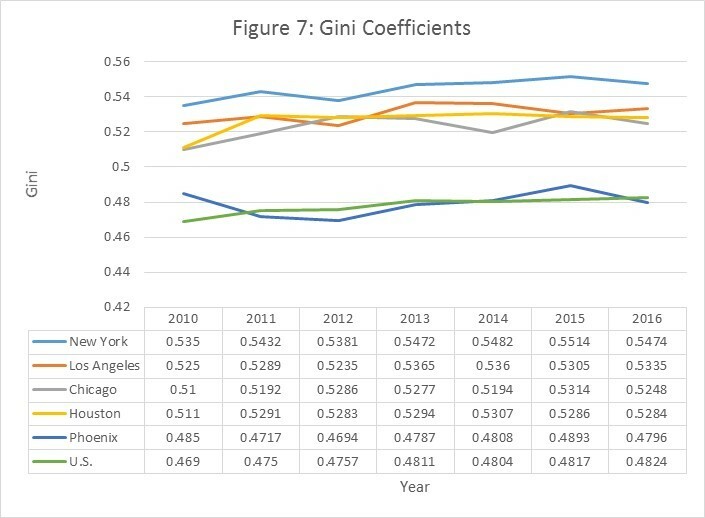 Chicago’s wealth concentration as measured by the Gini Coefficient remained above the national average but comparable to other cities its size (see Figure 7). The Gini coefficient (or Gini index) is a commonly used index of wealth concentration. The closer a country or city’s coefficient is to 0, the more equally distributed its income. The closer the Gini coefficient is to 1, the more unequal its income distribution. Of the five largest cities, New York’s coefficient was the highest. Indices for Los Angeles, Chicago, and Houston were clustered together, and Phoenix trended near the national average. For more information about the ACS Survey and how Woodstock Institute uses such data, please contact Research Director Lauren Nolan at lnolan@woodstockinst.org or (312) 368-0310.